A rare killer disease, Japanese encephalitis, has been annually and invariably breaking out in eastern Uttar Pradesh, India. This year, so far, 3,952 people have been affected. 914 are dead. It transpired at a Down To Earth editorial meeting on September 5, 2005, that such outbreaks are legion in this region: they have been happening for the last 27 years. Questions flew. What do people do? What action does the administration take? For the last 27 years? What's the procedure? Why here, every year? Storylines began to emerge. Among other possibilities, there came to light a prevention programme undertaken in affected areas, on paper only, indicating the state of public health initiative in Uttar Pradesh. Can nonchalant non-performance be the best way for a state administration to tackle disease? What was the future scenario? In the rural heartland of eastern Uttar Pradesh (up), it is difficult to find that criminal called Japanese encephalitis (je). je is transmitted from infected pigs to humans by mosquitoes. So I decided to track down villages with piggeries (pig-keeping is a survival profession here). Travelling from Gorakhpur city to Sardar Nagar block, I found villages with pigpens but no reported je cases. There were villages with je cases that had no pigs. No village I went to had reported more than two cases of je, called mastishk jvar (brain fever). Perfect name: it signifies the nature of this rare disease. Most people develop immunity to the je virus naturally after catching the infection from a carrier mosquito. But not all. In the 'not all' people, it reaches the brain.One out of three such people die. Up to half the affected get maimed. Nehru Hospital wards 1, 6 and 10. Most people diagnosed with je in eastern up and western Bihar come here. Ward 6 is on eternal boil. About 100 patients, 200 parents and relations, and 50 staff: 8 junior doctors, 4 more senior, about 10-12 nurses (talking, making notes, adjusting an iv needle, administering saline, glucose). Bed 41. Harikesh, 14, on it. Two doctors and two nurses are trying to revive him. After about 15 minutes, they give up. About 40 people seated on nearby beds look on sideways, from the corners of their eyes, hoping that by not turning, they would ward the same fate off their ward. Around bed 41 it becomes deathly quiet; from beyond comes the raucous philharmonic of medical mayhem, of epidemic beyond grasp. 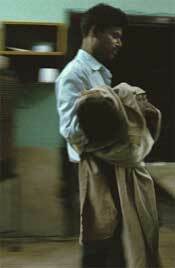 The dead child's uncle carries the body out, face expressionless, body shuddering. He goes to get a death certificate. I return the next day, I watch another child die on the same bed. Already, it seems easier. Most beds have two children sprawled on it, each connected by a narrow plastic pipe to a pouch of fluid, metal stands hovering over bedsides. More than a dozen children die every day. Sporadic cases in the villages. Horror in the wards. How many patients manage to reach brdmc ? How many deaths have no names/addresses in hospital records? How can a rare disease kill so many? Who's responsible? jeisn't new to up. Since 1978, the state administration has dealt with the disease. With great consistency and great efficiency. Consistently, it has done nothing. Very efficiently, it has ignored the disease. So far as democracy is concerned, the state has acquired special status. Data of the past 27 years shows clearly the way je behaves (see table: JE peaks). It is rampant in the humidity of monsoon, as water accumulates and mosquitoes breed in it. Data from two major hospitals catering to je patients this year shows patients are mostly from districts Kushinagar, Maharajganj and Gorakhpur (see table: UP, 2005). 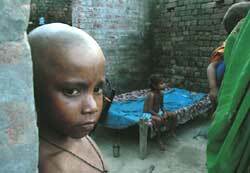 The number of people affected is higher in Kushinagar. Mortality is higher in Gorakhpur. Data from Gorakhpur also shows the disease has a distinct cycle (see table: 1978-2004).The most affected blocks in Gorakhpur include Pipraich, Bhathat and Sardar Nagar (see table: Affected). The state government blames untimely rain -- instead of coming late in August, it came in July this year, catching the administration unawares. Unbelievable. This, too, is true: when the health department machinery of eastern up should have been preparing for mosquito control, it was deployed in local body elections, till August. The state has no long-term programme. Mosquito control measures occur under the rubric of the National Malaria Eradication Programme. When Down To Earth asked O P Singh, director general (medical and health), up, about the lack of fogging and insecticide treatment in villages, he said his information showed such work was done in May 2005. If measures were taken in May, what went wrong? Most villagers say there has been little fogging or insecticide spray in the past decade, though these were regular earlier. Ram Daras, member of the block development council of Sardar Nagar block of Gorakhpur, says the village hasn't seen insecticide spraying since 1989. 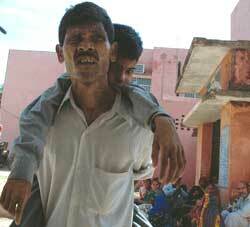 Arun Kumar, a 10-year-old from Jodhpur Bajah Tola village of the block, died of je at brdmc on September 8. Initially, villagers did not realise this was the village's first-ever je case. "After Arun's death, we are worried about our children," says Daras. They have been reading about bed nets being distributed; Union minister of health and family welfare Anbumani Ramadoss told Down To Earth he's issued 300,000 bed nets. They haven't received any. The fogging machine did come two km away, but didn't fog Jodhpur Bajah Tola. 2005 saw the up government come up with an action plan for je control. For the first time. It seems the news leaked out to the mosquitoes and the monsoon. The rains came in about the same time the action plan reached the district headquarters from capital Lucknow: July 21, 2005. The epidemic was already on: the first death was reported on July 29. But let's talk action plan. It highlights the need to break the mosquito-pig-human link. Pigpens must be pushed five km away from human habitation. Cover pens with mosquito nets. People must be educated on the need to protect themselves from mosquito bites. Reduce areas where water can stagnate in; use neem oilcake in fields to reduce vector fertility; spray insecticides to reduce vector numbers. Last resort: vaccines. The plan also maps out what should be done if a person falls ill with je. The person's house should be sprayed with insecticide, along with 50 surrounding houses. Burnt mobile oil should be dropped in stagnant pools to prevent breeding; pools should be filled up. The district administration has failed to do these. In Harkhapur village of Pipraich block, 6-year-old Neelu developed je, and fortunately recovered. A health official came to her house for spraying, but didn't spray in the surrounding 50 houses. Reportedly, more than half the fogging machines in Gorakhpur district are in a state of disrepair. "The cost of spraying is very high," complains D P Mishra, additional director (health) at Gorakhpur. "Mosquito control ought to begin from mid-April. But spraying 20 km requires 10 litres of malathion, which costs Rs 1,000. This then has to be mixed with 190 litres of diesel, which costs Rs 6,650. And then there are transport costs," he calculates. Given most of eastern up is je -land, it would take crores to just spray malathion: those who made the action plan up never thought of this cost. They never thought of implementing the plan at all. Here is an instance of illogical planning: the female Culex has a lifespan of 21 days and can infect only 9-12 days after picking up the virus, and the disease is expressed in humans 5-16 days after infection. Thus, chances of killing infecting mosquitoes aren't spectacularly high. But this is precisely a measure the administration has prioritised, instead of pursuing more effective mosquito control measures. Says T N Dhole, department of microbiology, Sanjay Gandhi Post Graduate Institute of Medical Sciences, Lucknow, "There is no logic behind spraying 50 houses around the house with a diseased person." Adds he: "We are not called for meetings on je control as we have an independent critique of government efforts. They come up with an action plan every year. After the epidemic, you would not be able to find a single copy." Even in Gorakhpur, the district administration maintains brdmc is exaggerating figures of je cases; it is doing so, the administration avers, so that brdmc can invite funds. But the fact is all additional funding for epidemic relief goes to the district health administration whereas brdmc falls under the medical education department. Irony of ironies, most people in the region take their je -stricken children to the medical college hospital, not the district hospital. The treatment at the college is far better, they say, even though the doctors are badly overworked. The action plan also suggests relocating pigpens five km away from residential areas. This is a nice idea, eminently applicable in sparsely populated areas. But eastern up is densely populated: there would be no village that doesn't have settlements in a radius of five kilometres. So, is it possible to remove the pigs? Gorakhpur district has about 24,000 pigs in 2,863 piggeries. The communities that rear pigs are also 40 per cent of the district's voters; thus, politicians don't take this step. But even if they were willing, it is mostly poor people from scheduled castes that rear pigs -- pigs provide insurance as they can be sold quickly at a neat price, thereby providing liquidity. The district administration has recently ordered a survey to find out if pig owners want to shift to an other means of livelihood, and if they need help to adopt new occupations. Since the early 1980s, pig-keeping was promoted in the area as a means to generate income. Banks offer loans, here, to buy pigs (and goats). The scheme was prioritised to help people below the poverty line. Though loans for buying pigs are far less today, the Gorakhpur Shetriya Gramin Bank gave loans for 700 pigpens in 2004-2005 and for 800 pigpens in 2003-2004 in Kushinagar, Gorakhpur, Deoria and Maharajganj. The State Bank of India has earmarked about Rs 2.25 crore as loans for pig rearing in 2005-2006. The solution here, as the action plan rightly recommends, is vaccinating pigs. One could argue, in the spirit of the action plan: pigs are bought on bank loans, so couldn't this measure be built into the loan procedure? There is only one problem: there isn't any pig vaccine in India. So the government has taken the next best option. It is administering 1,000 swine fever vaccines to pigs. Now, swine fever -- pig cholera, actually -- has no relation to je. The action plan, quite obviously, is more like a dream document. But what deserves a closer look is the latest placebo on offer: vaccines. Read on. The 2005 action plan of the up government to deal with je mentions vaccines almost as a footnote. Now, after many high-profile visits of politicians of various ilk to the affected areas, suddenly, "vaccines" have become the sure-fire solution to eastern up 's ills. The cry to make more vaccine doses available in the state is today almost universal. The World Health Organization has approved only one vaccine: that derived from mouse brain infected with the virus. This was first licensed in Japan in 1954, and is in production in India, South Korea, Taiwan, Thailand and Vietnam. Its sole manufacturer in India is the Central Research Institute (cri) in Kasauli, Himachal Pradesh, run by the Union ministry of health and family welfare. Vaccine making is a cumbersome, eight-month-long process.A strain of je virus is injected into the brain of mice and allowed to multiply for four days. Thereafter, the brain in taken out and the virus separated. The virus is then inactivated -- killed. This takes about 40 days. The vaccine is then purified and checked for quality parameters over two months. Then it is sealed and freeze-dried. cri's current capacity is 500,000 doses every eight months. It is trying to increase this to one million. Increasing to five million is likely to take two years. As a single mouse provides two doses, the institute will need 2.5 million mice. The existing stock of mice cannot be bred fast enough to meet that target. Moreover, mice need to be kept in a controlled environment to ensure quality. This would require 300 additional rooms to house the cages and 300 additional employees -- one person can attend to 250 cages with three to four mice each. Rooms require land. Thus, the je vaccine business is unprofitable for private companies (but see box: Should India import vaccines?). What about the state, then? K P Kushwaha, pediatrician in charge of the epidemic at brdmc, says the actual number of vaccines needed to cover all children in Gorakhpur is 40 million. up chief minister Mulayam Singh Yadav has sought Central approval to import only 7.5 million doses. Such permission isn't really necessary, for health is a state subject in India. The up government, quite clearly, wants to avoid accountability in purchasing vaccine. The state government has issued contradictory statements at various points in time about funding vaccine import. It has expressed willingness to pay for the imports, at the same time asking the Centre to provide funds because cri failed to meet demand. It's another matter that cri wasn't paid for the vaccine they provided earlier. The institute has written off payments due from various state governments. It now supplies only as much as the states are willing to pay for. 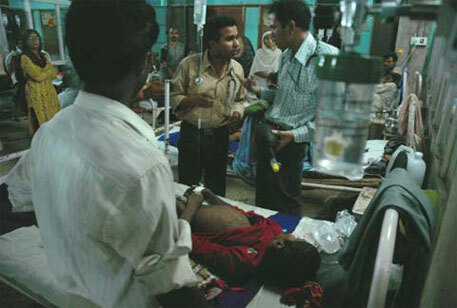 up has received about 100,000 vaccine doses in 2005. But a look into the vaccine delivery record raises serious doubts about the state government's ability to deliver vaccine to people, even if it has all the doses it needs. cri began to produce the je vaccine in 1987. Pipraich block of Gorakhpur was one of the first places it was tried out, in 1988, with help from brdmc's community health department. 4,342 people in the 3-25 years age group got the first dose. Of them, 3,164 got the second dose, and 2,267 the booster shot. Blood samples were taken before and after vaccination. Tests showed 85 per cent people had successfully developed antibodies. During the 1988 epidemic, vaccinated people were unaffected. Though the results were encouraging, the sample size was too small for definitive analysis. A larger pilot project was needed. That came in 2002. 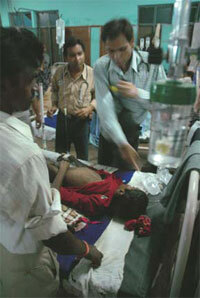 The health department provided 40,000 doses to Gorakhpur district. These were delived in 12 sub-centres of Chargawan, one of the worst-hit blocks. The physician at the primary health centre was willing to take the risk of trying them out, when other physicians were reluctant. 12,859 children in the age group of 5-15 years were given the first dose; 12,800 got the second dose; 11,293 got the booster dose. People involved in the project say the results were promising. But why did the project omit children below 5 years of age? Because the immunisation drive up launched in 2004 focused only on children in the 1-3 years age group. This is a puzzle. The 1988 project was for 3-25 years, the 2002 project was for 5-15 years, and the 2004-2005 immunisation drive was for 1-3 years. The basis of these decisions is unclear. And after receiving flak for mismanagement this year, the government is unwilling to share the paperwork on this. The only details they are willing to share are the number of people who have been administered vaccines. In 2004, children of 1-3 years in Gorakhpur and Kushinagar districts were given two rounds of the vaccine, and the booster dose is being given in 2005. All blocks of Gorakhpur, except Gola and Derwa, were included in this drive. 145,980 children got the first dose, 140,519 got the second, and 107,728 the booster shots. Despite this, many children 1-3 years old are reporting the disease: brdmc data shows that by September 22, 220 children below 2 years and 420 children under 5 years came there. This data hasn't been broken up regionwise, so it isn't clear if the 1-3 years cases are from blocks where vaccination was carried out. Is the government vaccination data true? Social groups working in Gorakhpur say vaccination hasn't been carried out. Shiraz Wajih, president of the Gorakhpur Environmental Action Group, posed this question to a gathering of village folk from Sardar Nagar and Compierganj blocks. Nobody had heard of je vaccination. R N Yadav, a practising physician in Sardar Nagar, told Down To Earth that, to his knowledge, no vaccination had been carried out. To check this out on the village level, Down To Earth visited Sarai Guleria village (also called Saraiyya) in Chargawan block, which was covered in the 2002 project as well as the 2004-05 drive (see box: The mystery...). Even if only some children got left out and people are generally unaware of what goes on in the village, this is a violation of the research guidelines of the Indian Council of Medical Research: in case of a pilot project, villagers have to be expressly informed. Microbiologist T N Dhole of Lucknow laments the lack of documentation on the vaccination drives: "Show us a child who has been vaccinated and we will check for antibodies in the blood to see if it has actually been vaccinated." As urgent as the need to import vaccine is an investigation into how up conducts its immunisation drives. 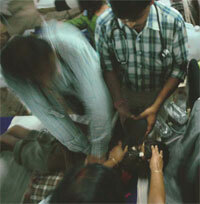 In this, up will do well to look at how other endemic states cope. Andhra Pradesh's efforts have drawn appreciation (see box: Ability to deliver). Perhaps a more in-depth enquiry is essential before projecting Andhra as a model of je control. But one thing is certain: up is a model of how not to control je. As of now, jeinupcan be tackled only through ameliorative fantasies. One such was verbalised by Rahul Gandhi, who wanted the area aerial fogged. He was willing to provide a helicopter paid for by the Congress party coffers. A state government spokesperson termed this a conspiracy in a press release. The press later reported that his idea had "apparently fallen victim to red tape". In Rae Bareilly, though, he got the specially equipped helicopter to carry out fogging. There is a slight problem: helicopters release pesticide at such a height that mosquitoes, hovering at not more than three metres from the ground, remain buzzingly unaffected. No wonder the Allahabad High c ourt has asked the state and the Central governments to provide information on the situation and the steps taken to control it. Everybody and his neighbour's saying one thing and one thing only: import vaccines. This undermines the fact that it provides only temporary protection. Studies at the Centers for Disease Control and Prevention at Atlanta, usa -- the world's premier medical research establishment -- show that antibodies to the je virus persist only three years after primary immunisation. Given the poor nutrition levels in India, post vaccination immunity may not last more than two years. In effect, the vaccination drive has to become an annual phenomenon. That doesn't look possible in a state with only about 16 per cent of the children fully immunised, for common vaccine-preventable diseases. If you ask about immunisation in villages, people talk about the times when the smallpox vaccines were administered. People fondly remember days when administration meant something; when fogging was carried out village to village before the onset of the epidemic season. 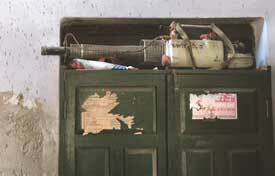 The district health machinery is now severely dilapidated. Gorakhpur didn't have a chief medical officer (cmo) from July 12 to September 23, when most of the deaths happened; the chief medical superintendent of the district hospital, S K Chakravarthy, has been holding additional charge of cmo. "The response would have been quicker had there been a full time cmo," he says. Besides, other important posts in the health department are also lying vacant: all eight posts of deputy cmo, 48 of the total of 78 posts of doctors at community health centres and primary health centres, as well as seven out of 57 health supervisors. So there is nobody to monitor if the auxiliary nurse midwives, the most basic health service provider in the villages, are doing their job. Villagers in eastern up are remarkably ignorant of how the disease spreads. "There is certainly a breakdown in surveillance," worries J Yuvaraj, assistant director of the Vector Control Research Centre, Pondicherry. "In an incurable disease like je, surveillance is extremely crucial. The departments of agriculture and health have to work in tandem at all levels: state, district and block. In most places, simple measures such as draining water in paddy fields for just a day in a week can give substantially improved results." What politicians and officials refuse to acknowledge is: environmental changes have added to the problem. A study by Tushaar Shah, principal scientist at the International Water Management Institute in Gujarat, Wells and Welfare in the Ganga Basin: Public Policy and Private Initiative, suggests groundwater be used for irrigation in Gorakhpur as the area is prone to waterlogging. Villagers in Gorakhpur say irrigation canals bring water only during monsoon when it isn't required, going dry in the rabi season. Obviously, water logging is linked to several factors. The government needs to make an honest effort to understand the drainage of eastern up. All this requires a serious interest in administration. Unfortunately, the politics in the state has transformed governance into the survival guide of politicians lurching from one crisis to another. This year's epidemic will soon be on the wane. Before long, the disease season would have gotten over. Villagers would be dealing with lack of irrigation. And lessons that could have been learnt this year, too, would be lost. The up government is on short notice.